You must make reservations at least 5 minutes in advance of the time at Market by Jean-Georges Restaurant. Open 7 days a week. 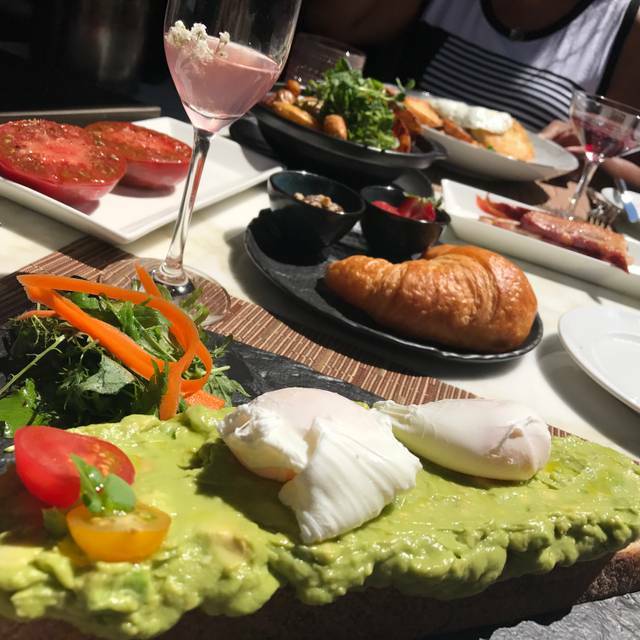 Breakfast from 6:30am - 11:00am daily Lunch from 11:30am - 2:30pm Monday to Friday Brunch from 11:30am - 3pm Saturday and Sunday Dinner from 5:30pm - 10:00pm Bar Menu at our Bar and Lounge from Sunday - Thursday 11:30am - 11:00 pm, Friday & Saturday 11:30am- 12:00am. Secured underground Valet parking as well as Impark Self Park is located at 1137 Alberni Street (on the 1100 block of Alberni Street between the Coastal Church and Urban Fare). Follow the Shangri-La sign down the ramp. The street level entrance to Market by Jean-Georges is accessible from 1115 Alberni Street. A glass elevator is also available to the left of the restaurant entrance, directly beside the Urban Fare grocery store. The concept of the “hotel as a home” extends to the restaurant as its casual family kitchen. 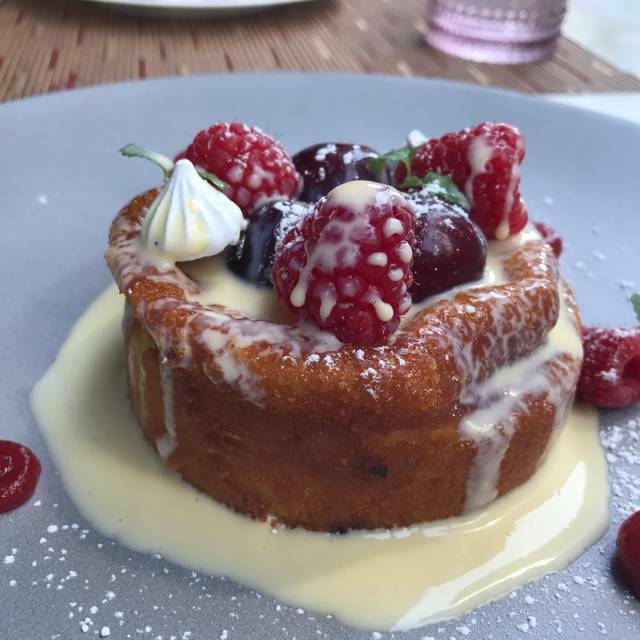 Inspired by the casual, simple elegance of modern dining, Jean-Georges has created menus that emphasize fresh, locally produced ingredients, served in a sleek and sophisticated setting. A destination restaurant with four distinct experiences: an intimate second dining room featuring a fireplace, a heated outdoor seasonal Terrace with city views, an enticing Bar and a sophisticated Dining Room. The full menu is available in all areas of the restaurant. The Outdoor ( Seasonal ) Terrace and Bar are on a first come first served basis. Please be advised that parties of seven or more are subject to an 18% automatic gratuity. MARKET'S four distinct rooms, each with their own character, allow you to tailor-make an evening and create a memorable experience. SIMPLE. ELEGANT. CREATIVE. 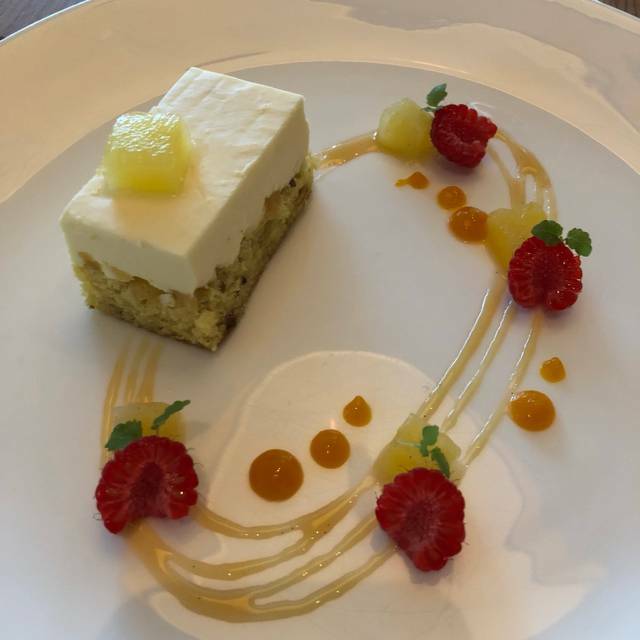 Best restaurant in vancouver for casual, elegant dining! Superb!!! The staff were all super friendly. When the manager delivered my food he accidentally knocked over my coffee onto my food. He was prompt to remake my pizza and offer me a free soup. In addition gift my daughters each a stuff animal and made them felt special. At the end also took my pizza off the bill. All around the service was wonderful, the food taste great and we had a very good time. The restaurant was quite empty and the food not as flavourful as I would have expected from Jean Georges. Our waitress knew the menu very well and was able to recommend excellent dairy-free options. We celebrated our anniversary and they brought out a card and a lovely DF dessert with writing on it at the end! I want to commend our waiter, Bobby for an excellent service. His recommendations were spot on, and we enjoyed talking to him. The food was wonderful. I only wish I had time for another dinner there. Had great time with my friend there. Service was good. The soup was excellent and the entrees were very enjoyable. The service was top notch. The decor f the restaurant was nice. We will be back the next time we are in town. It got the very best salad in town! I love it. Although we put a note that it was a special occasion, we were placed at the worst table ever (bistro table size for two) pinned against a big wall with no view at all. The dinning room was not even packed. The assistant manager saw that we were upset and came right to check on us. We were moved to a very nice large table for two by the window with view on Vancouver. The service from our server was good but nothing exceptional. 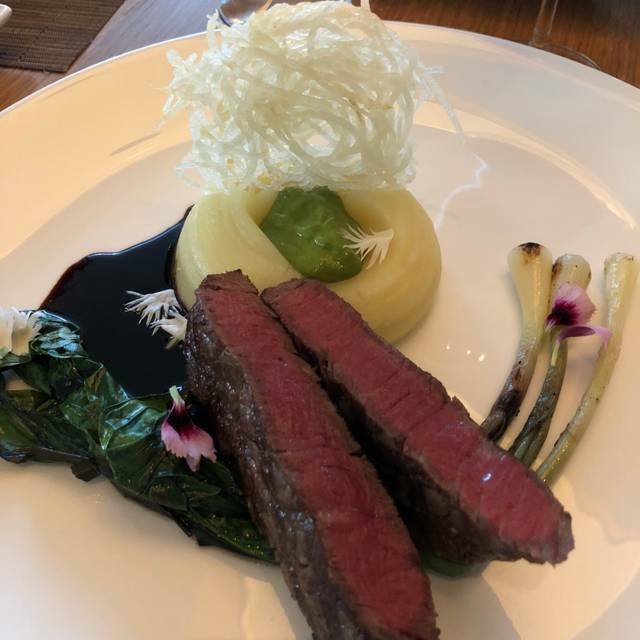 The food was average/good, we had high expectation since we are used to the best service and food in the Shangrila’s restaurants in Singapore. I would say the flavour, the sweetness and the saltiness of the sauces/marinate were not well balanced (either it was very salty or very sweet or both). The food was lacking of refinement and flavour nuances. I’d like to thank Mayank, the assistant manager, who was very attentive to our feedback and was eager to please us. 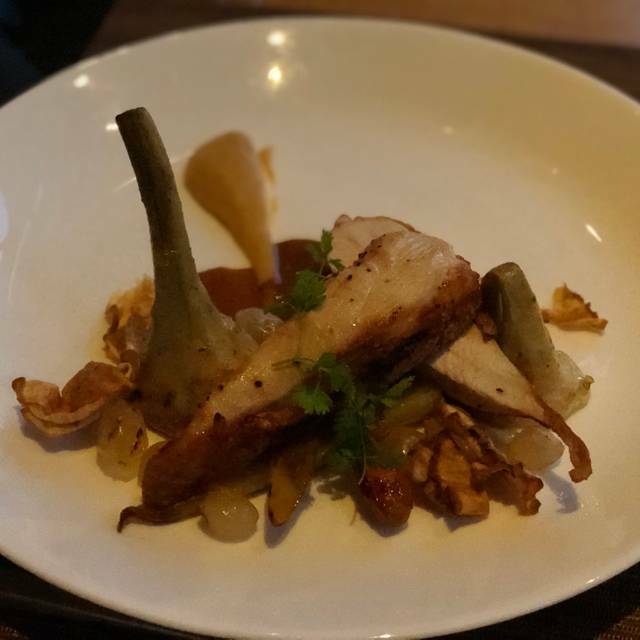 The food was exceptional, the ambiance is great and the service was quite good. However, we were provided incorrect information by the person calling to confirm the reservation which caused our reservation to be cancelled, then reinstated. During dinner there was a further mix up of an allergen being served to us. Nonetheless the staff had a great attitude, but I am surprised that an allergy that was noted several times still appeared on our table. Absolutely fantastic experience. Service was great and food was brought out in a timely manner. 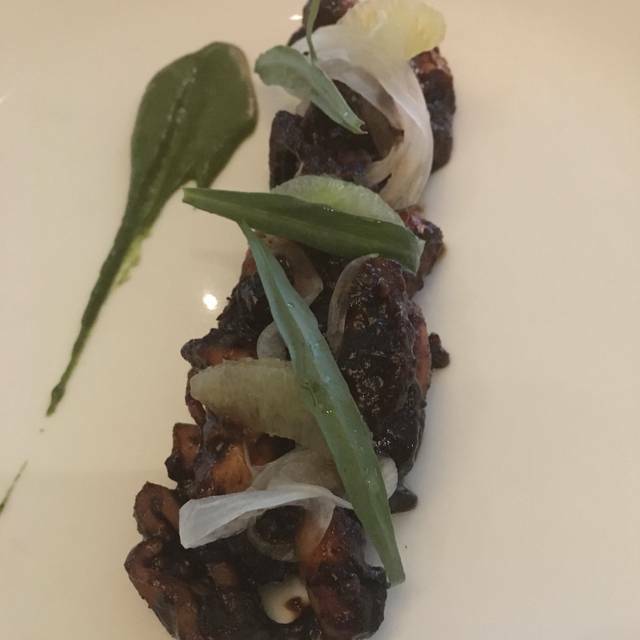 The tuna tartare and octopus were unbelievable. Drinks were very unique and different. This was our second visit, and it did not disappoint. Everything was perfectly prepared and delicious- from the cocktails to the dessert. We had beef tenderloin and crusty halibut, both beautifully seasoned and presented. The service was outstanding. Our waiter, Nathan, was attentive without being intrusive, and offered excellent recommendations. 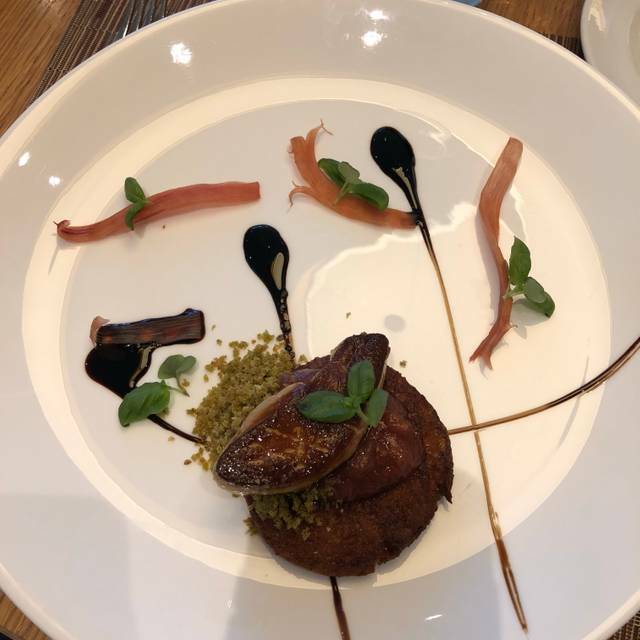 Furthermore, he really went the extra mile to accommodate my husband’s need to avoid onions - checking ingredients with the chef and ensuring that the alternative to our original choice was just as appealing. We were there to celebrate a birthday, and the specially plated dessert was also accompanied by a handwritten note from the maître d’ Simon. The entire team deserves compliments for a memorable evening and exceptional service. The dessert could have been better but the rest was outstanding. Amazing risotto, excellent service, very attentive. Lovely atmosphere. The service and food was extraordinary. I am blown away by how everyone we interacted with went above and beyond for us. I had put in a request to surprise my friend with something for her anniversary and they brought us chocolate covered strawberries :) we will definetly be returning to this restaurant! Loved the atmosphere, we got a really bad table to sit in, servers were nice, but noticed we waited a while for them to make their rounds. Servers are very accommodating. Food was delicious i got the tenderloin and my girlfriend got the chicken, both were tender and juicy. The only downside i feel like is i wish i got more food for the price. A little pricey, but to be expected for the level of ambiance, service and quality. We had a very nice, quiet meal. Much appreciated for a late Valentine's dinner. Amazing, a special dinner with great ambiance, service, and an amazing culinary experience. Beautiful place, excellent service. The food is delicious and a perfect ambiance. The period between each courses are horrible. My mom was full from her appetizer because we had to wait for more than 15 minutes. We ordered 2 juices for our drinks and it didnt come until my main course which I had to remind the waiter about it. He then said “I’m so sorry for that, coffee is on me later” and guess what... IT NEVER CAME! And I don’t want to remind him AGAIN. We had to wait for the dessert for about 10 minutes. Which was odd, the couple next to us ordered the same deserts but it came out faster than ours. Overall the foods are good, I wouldn’t say its to die for, its just okay. But the service is horrible.. I didn't find the steak special. It was just like any other steaks at different restaurants. My friends felt the same. Great menu choice even during Dine Out Vancouver. Menus included vegetarian and vegan choices. Very attentive team but not obvious. Good wine selection by the glass. Their AC blasts quite a bit, keep that in mind if requesting a window table. We went to try their done our menu. The food was great. But their service was subpar. We were seated without a drink menu. We had to ask for it and wait a while to get it. Then we ordered a champagne cocktail that was served warm. Once I let the server know he made news ones. While the drink was being made we told the server we wanted to do the wine pairing ( which he did not offer to us, I had to call him back to the table to say we wanted to do it) so when our new cocktails came 2 minutes later they brought the first wine which left us with two drinks at the same time. Overall I had a feeling that the server was ignoring us for being a young couple but kept giving all the attention to other tables. Outstanding quality and excellent service. 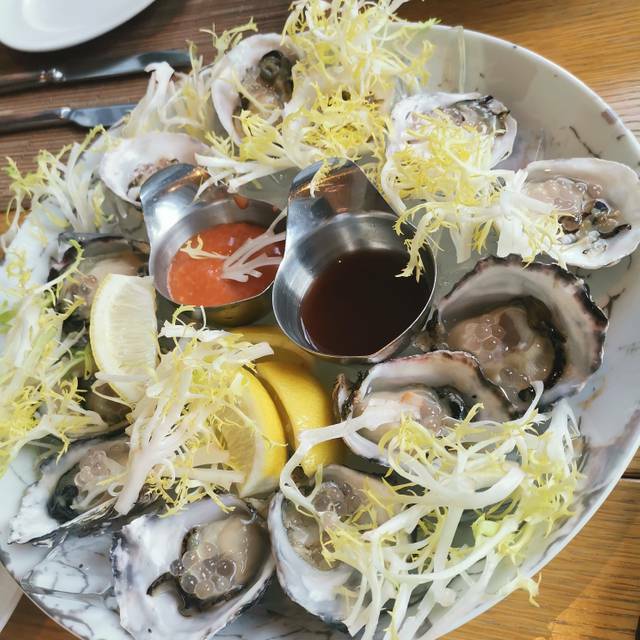 In the top 3 of my favourite Vancouver restaurants!! Highly recommend to anyone who seeks truly delicious and contemporary meals. Dine out lunch was a pretty good value - decent portions. Truffle pizza was tasty and I had a bite of my friend's seafood risotto, which was also very good. I came with my work colleagues for the Dine Out lunch menu. Amazing value! The seafood risotto was delicious and it was all so worth it. The staff were attentive and service was quick. Would definitely come here again for a team lunch or a client meal. It was the second time been there. We came for dine out menu and ordered salmon sashimi as appetizer as the first time visiting last two weeks. I quite disappointed to the salmon sashimi because the rice isn’t crunch and crispy at all and the rice texture quite weird; also salmon is fishy, and I had to ask the server to bring me some lemon slice for salmon sashimi. Steelhead and beef tenderloin were great. Food was superb! Ate here for the Dine Out Vancouver and the food was exceptional! The manager personally delivered the complimentary strawberries dipped in dark chocolate to my friend who's celebrating her birthday. Truly superb experience at the Market. will come back for sure! Thanks for an exceptional experience and great customer service from the front desk to the manager! Keep it up! First time at the restaurant for dine-out. Did not understand add-ons, food was average, in comparison to other restaurants at the $45 dine-out menu level. Service was impeccable. Went here to celebrate our 15 year anniversary during Dine Out Vancouver. I was very satisfied with my choices of the Tuna Tartare, Mushroom Risotto, and Peanut Butter Chocolate Bar. Our server Gil(?) was excellent. A small pet peeve of mine at restaurants was that the table next to us was seated about 15 min after us and their entrees (which was the exact same we ordered) arrived first. Also there were a couple of incidents of another table's food being delivered to our table, which was okay at first but a bit annoying. Overall, great tasting food and the service was good. Will come back here! Highly recommend for dinner or lunch. The food is fresh and done perfectly. We were here during dineout and didn’t expect much as service and food usually suffer during that time, but Market was beautiful. Our server Kanis was amazing, very friendly and helpful. Everyone thoroughly enjoyed their meal. The setting is very classy and romantic at night. During the day it’s a nice view of georgia/thurlow and it’s nice in the summer when you can sit on the patio. 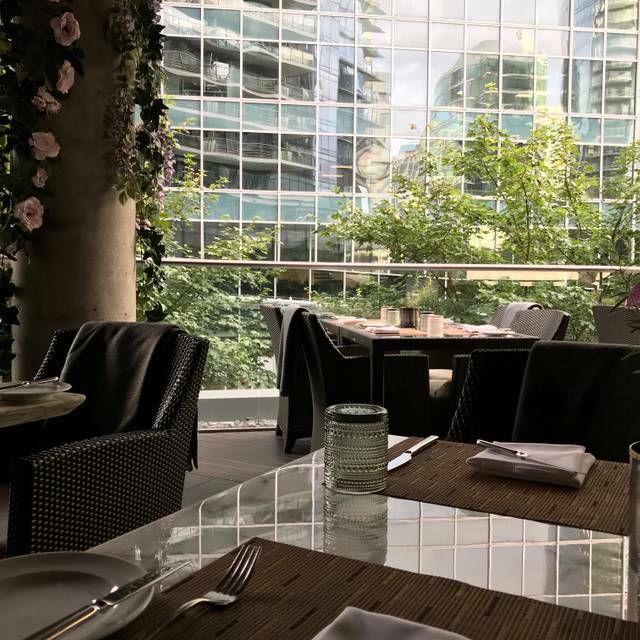 We heard a lot about this restaurant, and when we came with our daughter and son-in-law for Dine out Vancouver, it really was great. All appetizers: squash soup, seared tuna and salmon sashimi were great. The meat was one of the best in my life, and mushroom risotto was amazing. We were a little bit disappointed by the dessert choice, we would expect something more exquisite than just cheese cake or peanut butter bun. Booked as a birthday occasion but there was no recognition.